If you have downloaded Windows Vista DVD image and install Windows Vista, you must have wonder why you can select all editions of Windows Vista, including Windows Vista Ultimate and Windows Vista Home Premium are available on the DVD and allow you to select which edition of Windows Vista you want to install. This is actually part of Windows Anytime Upgrade program which allows Windows Vista users to upgrade to another edition of Vista operating system for more features and functionality, thus all versions of Windows Vista are stored on DVD in packaged form, or on a PC if the OS comes pre-installed, and depending on which edition of Vista you purchased, you will get a digital product activation key that can activate, unlock and install that particular Vista edition only, with option to upgrade to higher-grade Vista anytime. Open Windows Anytime Upgrade by clicking the Start button, then click on Control Panel, and then click on System and Maintenance. You will see Windows Anytime Upgrade in there, click on it. Windows Anytime Upgrade automatically takes you to the website where you can purchase the upgrade. Follow the instructions on each page. Select your desired upgrade edition. Purchases Vista upgrade online to secure a new digital key. After purchasing the upgrade, you’re instructed to download software that prepares your computer for the upgrade. The software takes a few minutes to download. 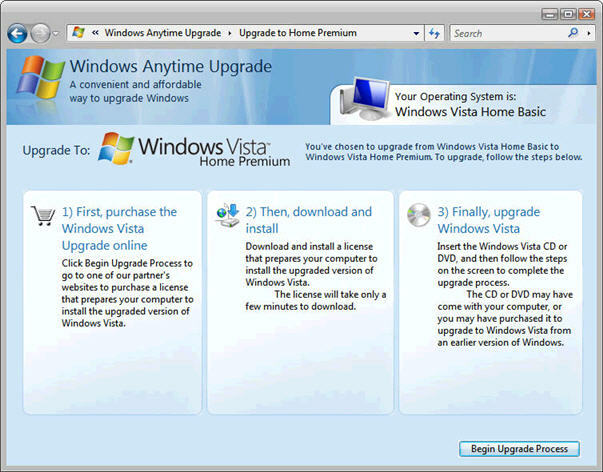 Then you can use your Windows Anytime Upgrade disc or the downloaded upgrade software with new product license key which allowed you to use and install the upgraded edition of Vista together with the Windows Vista installation DVD disc to complete the process by following the on-screen instruction. When the upgrade is complete, you will have a new edition of Windows Vista running on your computer. To learn more about the new features that you just installed, read “What’s new in Windows Vista” in the Welcome Center, which you’ll see on your desktop, or search for “What’s new” in Help and Support. Note that Windows Anytime Upgrade is not allowed to be use to upgrade a computer that’s running non-Vista operating system such as Windows XP. Other than from Microsoft, selected original equipment manufacturers (OEMs) and retail partners will also be able to offer Windows Anytime Upgrade as online merchants, thus you have the option to directly upgrade the version of Windows on you PC by indicating the upgrade need to your dealer during or after your initial purchase.